The U.S. Geological Survey (USGS) offers on-demand production of Landsat 4-5 Thematic Mapper (TM) Surface Reflectance data through EarthExplorer. Surface Reflectance products provide an estimate of the surface spectral reflectance as it would be measured at ground level in the absence of atmospheric scattering or absorption. The Surface Reflectance products are generated at the Earth Resources Observation and Science (EROS) Center at a 30-meter spatial resolution. The EROS Science Processing Architecture (ESPA) on-demand interface corrects satellite images for atmospheric effects to create Level-2 data products. Landsat Ecosystem Disturbance Adaptive Processing System (LEDAPS), a specialized software originally developed through a National Aeronautics and Space Administration (NASA) Making Earth System Data Records for Use in Research Environments (MEaSUREs) grant by NASA Goddard Space Flight Center (GSFC) and the University of Maryland (Masek et al., 2006), applies radiometric calibration and atmospheric correction algorithms to Level-1 Landsat data products. 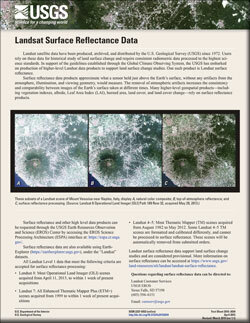 Details about Landsat 4-5 Surface Reflectance can be found in the Landsat 4-7 Surface Reflectance Product Guide. Surface Reflectance is not run for a scene with a solar zenith angle greater than 76°. Users are cautioned against processing data acquired over high latitudes (> 65º) to Surface Reflectance. Landsat 4-5 TM scenes processed through the National Landsat Archive Processing System (NLAPS) cannot be processed to Surface Reflectance. Information about NLAPS, and a listing of NLAPS-processed scenes, can be found on LPGS and NLAPS Processing Systems Comparison. Order submission and completion emails provide details about data processing status and download instructions. Surface Reflectance products requested through EarthExplorer are delivered in GeoTIFF format. The original Landsat scene mapping grid, Universal Transverse Mercator (UTM) or Polar Stereographic (PS), is retained for the Surface Reflectance product. Additional Level-2 data products and format options are available when accessing ESPA directly. Select scenes in EarthExplorer using the Order Scene icon in the Results tab. Go to the Item Basket (top toolbar) or View Item Basket (below result list) to review the on-demand order. Click on L4-5 TM C1 level-2 to expand the list to view the selected scenes and verify the product type. Select Proceed to Checkout then Submit Order to initiate the processing for Surface Reflectance products through ESPA. Albers Scene Bundles contain 30-meter Collection 1 Level-2 products including Top of Atmosphere (TOA) Reflectance, Surface Reflectance (SR), Top of Atmosphere Brightness Temperature (BT), Surface Temperature (ST), Dynamic Surface Water Extent (DSWE), and Quality Assessment (QA) projected to the Albers Equal Area (AEA) map projection. The Landsat Analysis Ready Data (ARD) consists of Top of Atmosphere (TA) reflectance, top of atmosphere Brightness Temperature (BT), Surface Reflectance (SR), Provisional Surface Temperature (ST), and Quality Assessment (QA) data. U.S. Geological Survey, 2015, Landsat surface reflectance data (ver. 1.1, March 27, 2019): U.S. Geological Survey Fact Sheet 2015-3034, 1 p., https://doi.org/10.3133/fs20153034.